And thus ends today's treatise on grilling chicken. Use your knowledge wisely, Grasshopper. 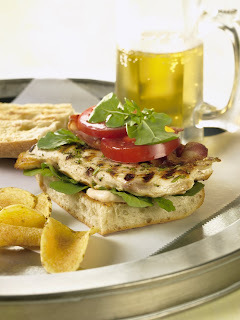 With meat mallet, pound chicken breasts between sheets of waxed paper to ½ inch thickness. Season chicken with salt and pepper; sprinkle with rosemary. 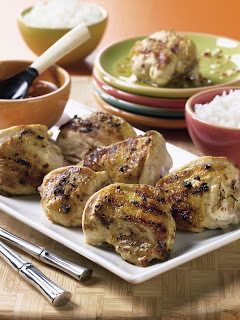 Drizzle olive oil evenly over chicken and, using fingers, rub herb and seasonings into chicken. Refrigerate until needed. Prepare gas or charcoal grill. Prepare spicy chile mayonnaise by placing jalapenos and garlic cloves in small skillet over medium-high heat. Cook and turn as necessary to brown evenly and chiles and garlic are softened. Set garlic aside to cool, then peel. Transfer chiles to small bowl of water and keep submerged for 20 minutes. Place garlic, vinegar and honey in bowl of food processor fitted with metal blade. Pulse to combine. Remove chile from water, stem, seed and add to processor. Pulse to chop and then puree until mixture forms a rough paste. Add mayonnaise, salt and pepper and pulse evenly to blend. Transfer to small bowl and refrigerate until needed. Place chicken breasts on grill and cook, turning once, until done, about 3 minutes per side. Remove from heat and cover with foil. Finish sandwiches by lightly toasting each side of rolls. Spread spicy 2 tablespoons chile mayonnaise on bottom half of rolls; top each with chicken breast half. Add two slices of bacon to each sandwich; divide arugula among sandwiches. Secure sandwiches with tops of buns and serve. Place peppercorn-coriander paste in large bowl; stir in fish sauce and blend well. Add chicken to marinade and turn to coat. Let stand, covered, at room temperature for about 1 hour or in the refrigerator for as long as 3 hours. Prepare gas or charcoal grill. Place chicken on grill 4 – 5 inches from flame, bone-side down, and grill until bottom is starting to brown, about 6 – 8 minutes. Turn chicken pieces and continue cooking until golden brown on other sides and juices run clear when meat is pierced with fork, about another 6 – 8 minutes. Transfer chicken to platter and top each piece with up to one-quarter of the hot and sweet dipping sauce. In food processor, combine 4 tablespoons black peppercorns, 6 large garlic cloves, 1 tablespoon ground coriander and 1/8 teaspoon salt. Pulse about one minute, to consistency of paste. Add 1 teaspoon Thai fish sauce and combine well. In small saucepan, bring to a boil over medium-high heat ½ cup rice vinegar. Stir in ½ cup sugar; continue stirring until sugar is completely dissolved. Lower heat to medium-low and simmer 5 minutes. With the back of a spoon, mash 1 large garlic clove. Combine mashed garlic with ¼ teaspoon salt and 1 teaspoon dried red pepper flakes. Remove vinegar mixture from heat; stir garlic mixture into vinegar sauce and blend well. Cool to room temperature.